Researchers say the large portion of Americans who take every opportunity to make huge, unapologetic displays of their patriotism are matched in number by those who scoff at the idea of having any pride in the country at all. DURHAM, NC—Confirming that the vast majority of U.S. citizens possess either too much or too little patriotism, a new study released Wednesday by researchers at Duke University has found that only 5 percent of Americans feel the correct amount of pride in their country. The three-year study, which analyzed thousands of casual conversations, online discussions, exchanges at family gatherings, and parade attendance records, concluded that Americans routinely fail to display a level of patriotic sentiment that reflects a balanced appreciation of what makes the United States great as well as what makes it flawed. 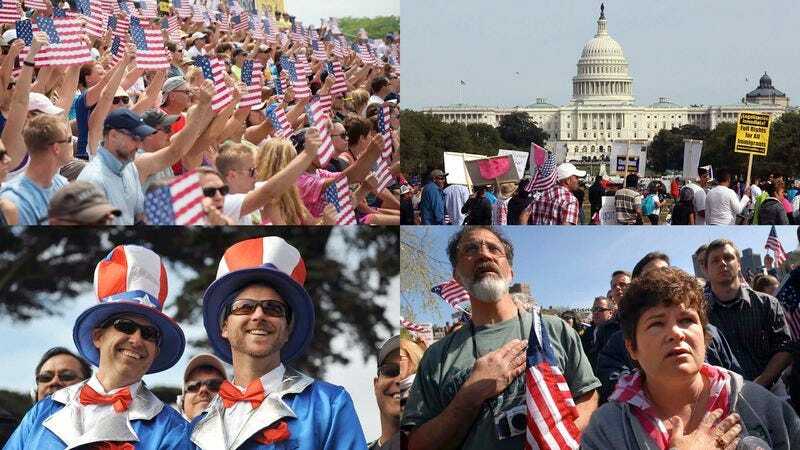 According to the study, approximately 74 million Americans exhibit a degree of pride so excessive that any criticism of U.S. policy causes them to angrily state that people who do not love the country ought to leave it. But the report confirmed this group was matched in size by those whose pride is so deficient that they steer nearly every conversation back to the subject of the nation’s shortcomings, loudly declaring it to be so irreversibly broken that they would be better off moving their family to Canada, or perhaps Scandinavia. Researchers discovered that individuals in the first category make a point of telling others they only buy products made in the United States, reflexively and repeatedly refer to the U.S. as the “greatest nation on earth,” and pay their bills with patriotically themed personalized checks. The other group, meanwhile, reportedly challenges anyone who professes happiness at living in the United States, vehemently refuses to recognize Columbus Day, and rolls their eyes at most personal displays of the American flag. The study also noted that the percentage of U.S. citizens who possess exactly the right amount of love and admiration for their country has fallen sharply in recent decades and currently stands at an all-time low, having declined from a record peak of 36 percent in 1776. Ultimately, Verbeek explained, fewer Americans than ever seem capable of feeling good about where they’re from without also believing the place of their birth makes them more important than everyone else.